The Project Management Triangle (also called Triple Constraint or the Iron Triangle) is a model of the constraints of project management. Every project needs to be delivered under certain constraints, namely time, cost and scope (quality). The time constraint refers to the time taken for the completion of a project. Cost refers to the project budget and scope refers to the doable activities to produce the project’s end results. These three constraints are often competing and hardly ever meet. Increased scope denotes an increase in time and cost. A tight timeline constraint results into an increase in cost and reduced scope (quality). 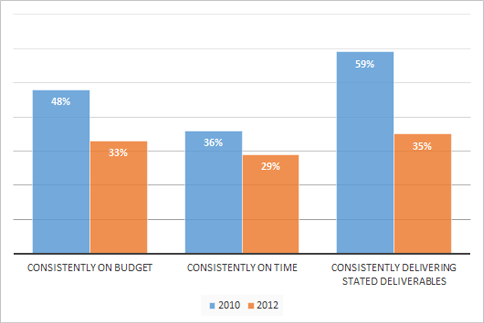 A tight budget refers to increased time and reduced scope (quality). 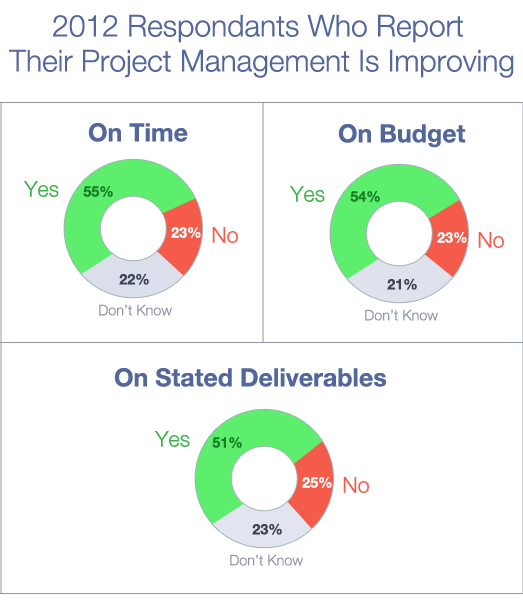 The pie charts clearly showcase that at the end of the day, organizations are still delivering only 30% of projects which meet all the three constraints. Even with the best Project Manager leading the team, Projects can go awry in the absence of a right tool, which helps in managing the projects wisely. Therefore, we offer you a Project Management Software that has helped over 700,000 Project Managers to make their Projects a success. Ever wondered, why resource allocation and management are considered the trickiest tasks in Project Management domain? Likewise, Resources in any organization may consist of time, equipment, people involved in a particular activity and material used. If you are a Project Manager, you will fully understand that managing a resource in an organization is one of the trickiest task ever, as organizations typically have limited resources to utilize. This is why, a Project Manager who rightly understands the value of Resource Management and allocation can greatly contribute in making the project a grand success. Typically, an ideal resource plan is the one that is as detailed as possible and lists down the type of resources required for an individual task. However in a normal set up, it is highly unlikely that the Project Manager will have detailed information about all the resources that will be utilized in various phases of the project. This makes it important to plan as per the resource availability at the time of planning and modifying it later, when other unknown resources are available. In the Project management domain, it is a common practice to set a baseline schedule and resource plan while planning with known resources. An ideal corporate resource management process is the one which guarantees that resources are never over-allocated across multiple projects. Whether you want to write how you like this blog or wish to share your story about how you handle projects, do comment and share your views. 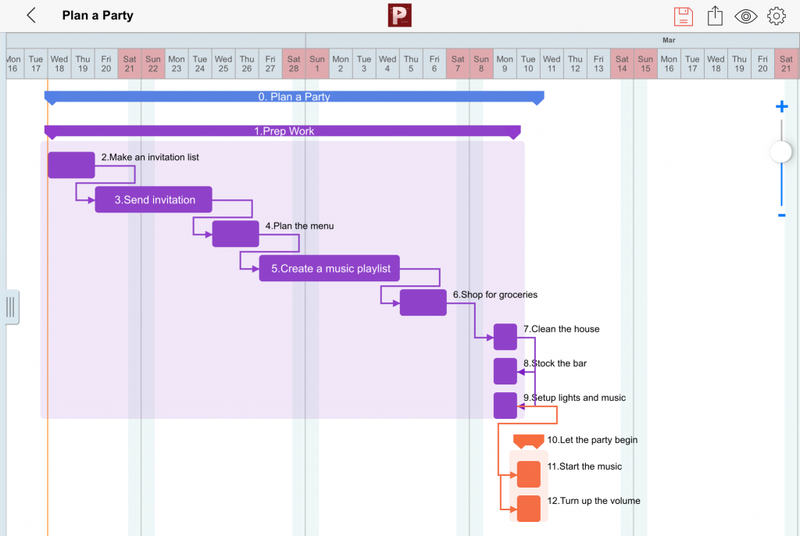 Setting dependencies between tasks is the most powerful feature of Project Planning Pro. The in-built auto-scheduling engine of the app is able to update the dates of tasks based on changes that are made to its dependent tasks. 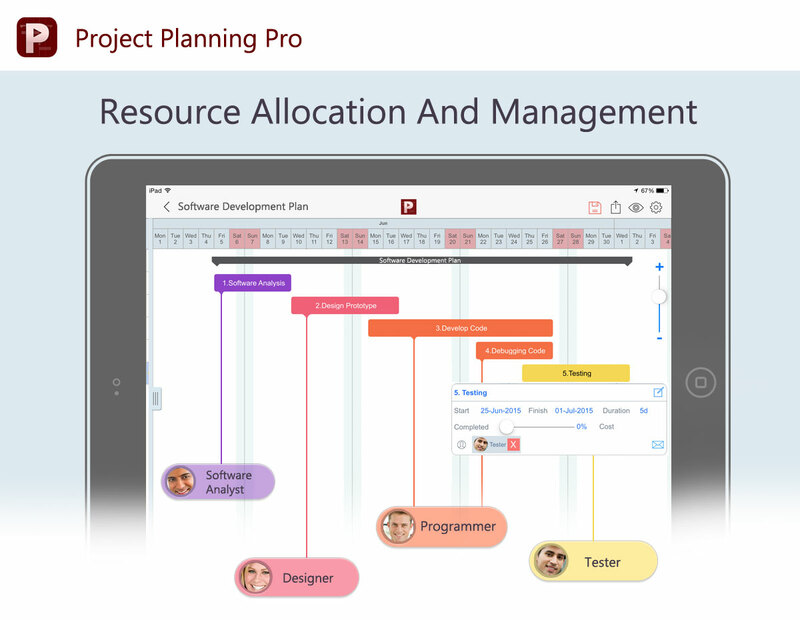 It is important to understand the types of dependencies that can be used in Project Planning Pro. 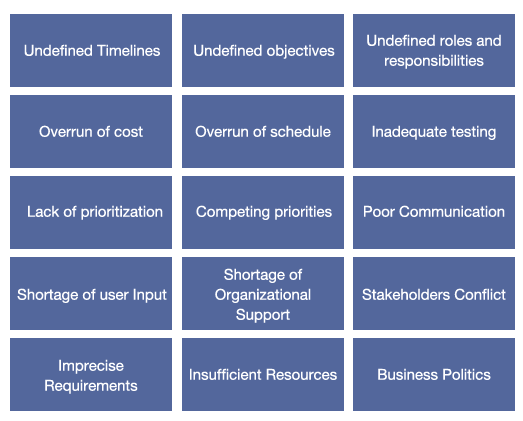 This is the most common type of dependency between tasks and a type that is used most often. This dependency means that if there are 2 tasks TASK A and TASK B, then TASK A (FS) TASK B means that, TASK B can begin only once TASK A is completed. In other words if TASK A is delayed by a day, then TASK B will also be delayed and will begin a day later. If TASK B cannot finish before TASK A is completed, you can use the Finish-to-Finish dependency. Note, that it does not mean that both the tasks have to finish together. In other words, TASK A has to finish in order for TASK B to be completed. If TASK B cannot start before TASK A has started, you can use the Start-to-Start dependency. Note this does not mean that both the tasks have to start together. In other words, TASK B can start anytime after TASK A has started but not before. When TASK B cannot be completed before TASK A has started, you can use the Start-to-Finish dependency. 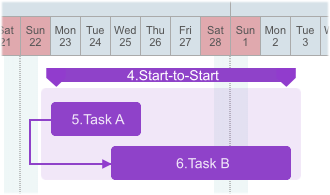 Note TASK B can finish any time after TASK A has begun. This is the most tricky and rarely used type of dependency. We recommend you use it only if you are sure about it. Step 3: Release selection to add dependency. Note: The start date of Task Id 3, moved forward automatically to the 20th since we gave it a Finish-to-Start (FS) dependency with Task Id 2. Double tap the dependent task to activate inline-editing mode. Tap on the predecessor field to add predecessor or successor and type of dependency. 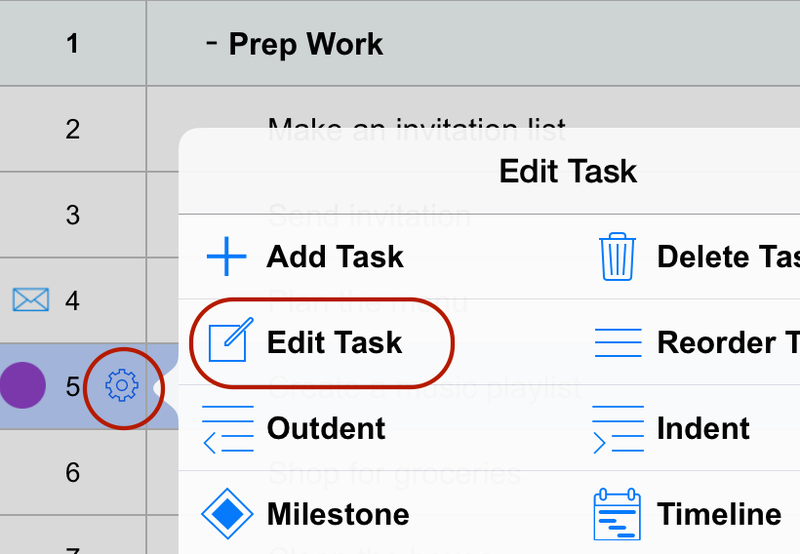 Select a task, tap the gear icon in the task id field and launch Edit Task view. 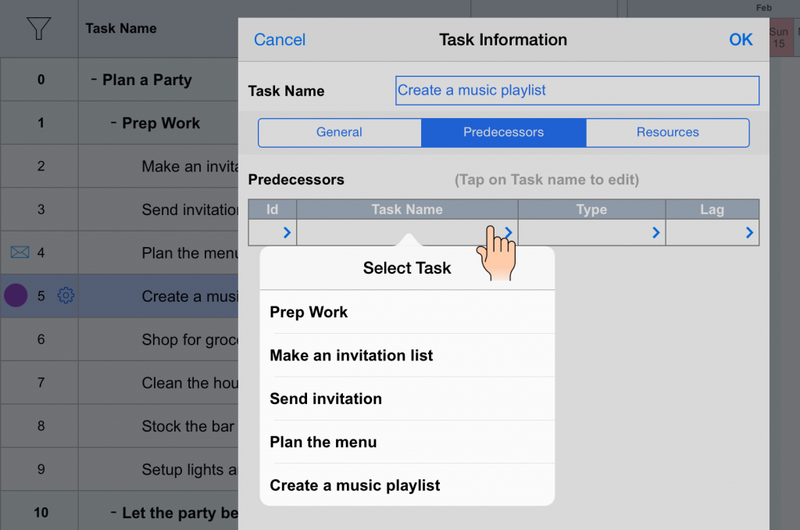 In the Edit Task view, move to the predecessor tab and tap the Task name field to select dependency. Tap the Type field to select the type of dependency. Once you have set your dependencies, you will see that Planning Pro has calculated the project end date based on the task links that you have created. If you now change the date or duration of any task, PPP will recalculate the dates of all dependent tasks and the entire project. 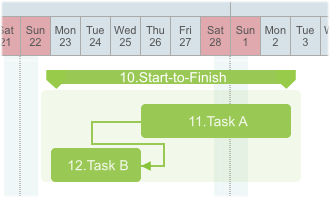 Once you have set the task dependencies you can assign resources to your tasks. 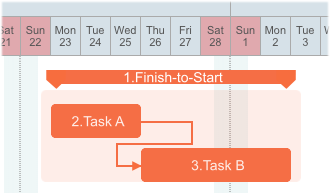 The next section covers adding resources to your tasks.